Whether you are planning an elaborate formal ceremony with family and friends, or an intimate alternative ceremony before eloping, you and your partner will enjoy a special day to form a happy and lasting memory. I have the experience, creativity and open mind to work with you to create the perfect ceremony. I will listen to you as a couple taking the time needed to get to know you both so the ceremony will be a very personal one, specifically designed to reflect your personalities and fulfil your aspirations for the day. As a Justice of the Peace, I have a professional attitude but at the same time am flexible with my time and delivery. 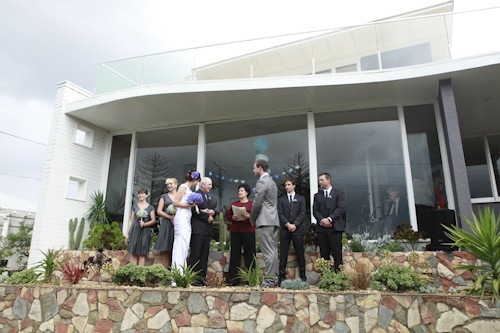 The setting for your special day is limited only by your imagination, a rising sunset over surf beaches, rugged costliness or the incredible vista of Halls Gap, I am able to work with you as a couple to make your day an amazing memory that will last forever. I can provide appropriate wording for your exchange of vows or you as a couple can devise personalized vows of your own. I will work with you every step of the way providing as much input as you require, whether it be by phone, email, fax or even post. My warm friendly and organized manner will make planning your ceremony stress free.